In the book "The Demon Haunted World Science as a Candle in the Dark" Carl Sagan looks at many forms of superstition such as Ufos, witchcraft and he also discusses religious beliefs. He discusses demons and how they were supposedly sent from some sort of god to control humans.Sagan also discusses therapy and how many therapists lead their clients to believe certain events, such as a alien abduction, as the truth in order to further therapy sessions. Sagan shares his skepticism about topics such as reincarnation, ESP, and psychokinesis. Sagan speaks about scientific ways to figure out phenomenons such as using mathematics to figure out winnings in sports instead of believing in winning streaks. Sagan states that science can be used a form of problem solving in the world because it uses testing to come to a proven conclusion. Carl Sagan goes in to detail about phenomenons such as seeing faces of celebrities in food. Carl Sagan also talks about the imagination and how it can lead people to have hallucinations and believe in the paranormal when there is no empirical evidence. Sagan often discusses aliens and the many claims that people have about being abducted. 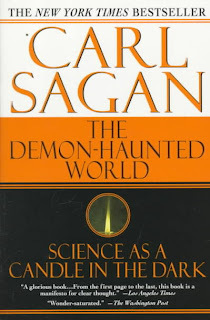 Carl Sagan used the "Demon-Haunted World" to open the eyes of his readers to and to make them understand that certain theories and treatments must be thoroughly analyzed first before a person should believe in these theories. Carl Sagan states the differences between science and pseudoscience. My favorite part of the book "The Demon-Haunted World" is Chapter 10 which is entitled "The Dragon in my Garage". Sagan starts chapter 10 by making a hypothetical situation in which he claims that there is a dragon in his garage. When the participant asks to see the dragon Sagan states that the dragon is invisible. The participant continues to press for evidence that the dragon exists because they believe what Sagan has said about the dragon being real. Sagan's claims become more ridiculous about the dragon in his garage. For example, Sagan claims that the dragon floats in the air and that is why it will not have footprints in flour and the dragon breaths heat less fire so it can no be detected by a radar. The participant believes every word and continues to press on with more suggestions of how they can see the dragon. The dragon test relates to the Q-Ray bracelet. There is no empirical evidence that the Q-Ray bracelet works, but millions of people will still purchase it because others on the Q-Ray website claim that it work. An additional example of the Sagan's dragon test relating to the pseudoscience and the paranormal class is alien sightings. Thousands of people have claimed to have seen aliens, but that should not be enough evidence to prove that aliens exist. No matter how unrealistic a topic may be people will still believe in it because others state it as the truth. A topic that relates to the pseudoscience and the paranormal class is the belief in UFOs and also the fact that therapists do not reject the claim of a UFO abduction from their clients. "I'm surprised that there are psychiatrists and others with at least some scientific training, who know the imperfections of the human mind, but dismiss the idea that these accounts might be some kind of screen memory." (Sagan 173)This relates to the section in the pseudoscience and the paranormal lecture about dreams in which the therapist does not discourage the false memories created by clients in their dreams, but instead encourages them so that the therapist can have control over the therapy session. Also, this section of Sagan's book "The Demon-Haunted World" relates to the pseudoscience and the paranormal course because the lecture contained many videos that showed people who claimed to be abducted by aliens which gives many others the lead way to also claim that they have been abducted by aliens.Sagan discusses a book that he read entitled "The Fifty-Minute Hour" in which a psychoanalyst name Robert Linder was suppose to treat a physicist with the code-name Kirk Allen, who believed that he could travel into the future and see space crafts. The more Linder heard Allen's stories, the more he believed that they were true. This relates to the pseudoscience and the paranormal class because the more claims that people hear about UFO abductions and products that claim to treat depression such as aromatherapy the more they believe in these claims and try false solutions to their problems. The last chapter of Carl Sagan's book is chapter 25 which is entitled "Real Patriots Ask Questions" made me think about the book "The Demon-Haunted World" outside of class. Sagan states that "The methods of science-with all of its imperfections-can be used to improve social, political, and economic systems, and this is, I think, true no matter what criterion of improvement is adopted." (Sagan 423) Sagan also states that "In almost all cases, adequate control experiments are not performed, or variables are insufficiently separated." (Sagan 423) The world faces many problems that need to be experimented over and over again until a solution is found. By just trusting people who claim to be an authority in a certain subject without question we will never know the answers if we do not completely agree with what this authority figure is claiming. If people start to look things scientifically and if people demand an answer that can be proven than a lot of issues within our society can be cleared up. 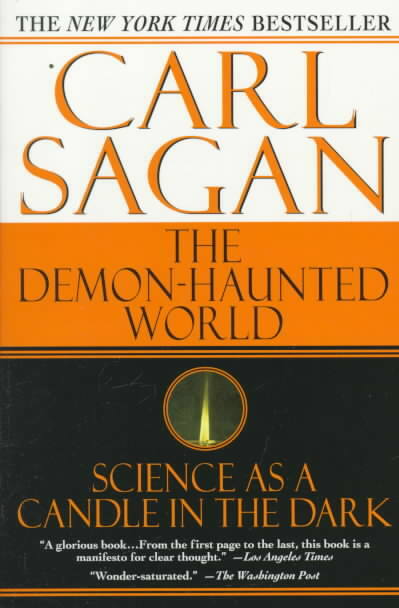 Sources: The Demon Haunted World Science as a Candle in the Dark by Carl Sagan, Ballantine Books, New York, 1996.